Australian Open champion Roger Federer beat Stan Wawrinka 6-4 7-5 in an all-Swiss final to win the BNP Paribas Open - his fifth Indian Wells triumph. World number 10 Federer claimed the first set before being broken for the first time at this year's tournament in the first game of the second set. Wawrinka, the world number three, went 2-0 ahead before Federer won three games in a row on his way to the title. Elena Vesnina beat Svetlana Kuznetsova 6-7 (6-8) 7-5 6-4 in the women's final. Federer becomes the oldest champion in the tournament's history, surpassing Jimmy Connors, who was 31 when he triumphed in 1984. This was the 23rd meeting between Federer, an 18-time Grand Slam winner, and Wawrinka. Federer, 35, has beaten his compatriot, who was in tears at the end, 20 times. "This has been a fairy tale week," said Federer. "It's a beautiful feeling. Maybe it's not as surprising as Australia but it's still great to back it up by winning in America. "It's a dream start to the year. I have totally exceeded my expectations. It's been an unbelievable start to the year." The women's final lasted just over three hours as Vesnina came back from the dead to secure the biggest title of her career. Eighth seed Kuznetsova edged a marathon first set lasting 71 minutes by winning a tie-break. Vesnina, the 14th seed, trailed 4-1 in the second set before winning four games in a row to force a deciding set. She trailed 4-2 in that set but again won four successive games to clinch victory and she collapsed to the court with a mixture of ecstasy and exhaustion at the end. Vesnina, 30, was playing in her first final at a 'Premier Mandatory' event - those at Indian Wells, Key Biscayne, Madrid and Beijing. Kuznetsova has now lost three finals at Indian Wells, having also been runner-up in 2007 and 2008. A 90th career title for Federer, who has won 13 of the 14 matches he has played in 2017 - with six of those wins coming against fellow top-10 players. It is not easy being Wawrinka in a match against Federer: he has played a whole career in his shadow and has now lost all 15 of the hardcourt matches they have played. 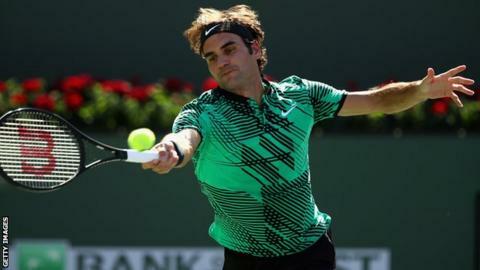 Federer's stronger belief was very much in evidence as he broke in the final game of each set to continue his dream start to the year. Top of the 2017 ranking points list, he has accumulated nearly twice as many points as second-placed Rafael Nadal.